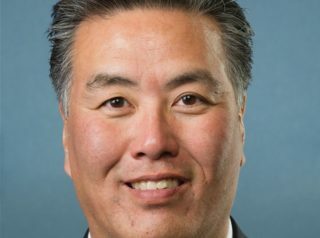 Mark Takano was born on December 10, 1960, in Riverside, California. After earning a B.A. in Government from Harvard University in 1983 and a teaching certificate from UC Riverside in 1987, he worked 24 years as a teacher in the Rialto Unified School District. He also sat on the Riverside Community College District’s board of trustees from 1990-2012. In 2000 Takano earned an M.F.A. in Creative Writing for the Performing Arts, from UC Riverside. Takano grew up Republican but became a Democrat in the early 1990s, just before his failed 1992 run for California’s 43rd Congressional District seat in Congress. “My whole family is Republican and I was a Republican all the way through college,” said Takano. “But my Harvard education really had an impact. It truly made me smarter. I became a Democrat.” In 1998, Takano lost yet another congressional bid. Fourteen years later, in 2012, Takano again ran for a seat in the House of Representatives—this time winning the race in California’s 41st Congressional District. He continues to hold that seat and is a member of the Congressional Progressive Caucus (CPC). The first openly gay Asian member of the House, he also sits on the LGBT Equality Caucus. At a Netroots Nation conference in June 2013, Takano and some other CPC representatives unveiled their “Raise Up America” campaign—a three-point plan that called for increasing the national minimum wage, making it easier for low-wage workers to unionize, and requiring federal contractors to pay their employees a “living wage.” Said Takano: “We stand in Congress on the side of the 99 percent against the one percent. So we need this campaign, we need to raise the minimum wage, we need to raise up the 99 percent of America.” Takano again spoke at a Netroots Nation gathering in 2015. In early 2013, Takano and a number of fellow elected officials and activists—most of whom were aligned with the Democratic Socialists of America—drafted a proposal urging President Obama to award a posthumous Presidential Medal of Freedom to the late Fred Ross Sr., a radical who had been trained by Saul Alinsky and had served as a mentor to both Cesar Chavez and Dolores Huerta. Over the course of Takano’s political career, one of his more noteworthy supporters has been the organization J Street. For an overview of Takano’s voting record on a variety of key issues during his years in Congress, click here. Further Reading: “Mark Takano” (Ballotpedia.org, Votesmart.org, Keywiki.org); “Netroots Grassroots: Progressive Caucus Launches ‘Raise Up America’ Drive” (People’s World, 6-24-2013); “Government Reform” (by Mark Takano, re: VRA and Voter ID laws); “Dems Push Boehner to Postpone Netanyahu Speech” (Breitbart.com, 2-19-2015).